Royal Enfield knows the difference between an old motorcycle and a retro motorcycle. That's apparent when a guy selling a modern Royal Enfield on CraigsList advises anyone buying it to plan to leave for every destination a half hour early. That's how much time you can expect to lose, explaining to people you encounter along the way that it's not really as old as it looks. It's nearly new — and, no, you didn't "restore it yourself." So new Royal Enfields do look convincingly old, while offering modern conveniences, such as a warranty and an impressive front brake — neither a feature of an old Royal Enfield. But is retro really satisfying? Truly old stuff has its own appeal retro design can't duplicate. Our recent vacation stay at a National Park lodge in Oregon had me musing about the difference between retro design and really old stuff. The lodge at Crater Lake National Park looks original, but its claim to date from 1909 is suspect. "Redesigned" in the 1990s, little remains of the original structure. We were delighted with its old timey appearance combined with modern conveniences. There was no lodge at our next stop, Lassen Volcanic National Park in California. 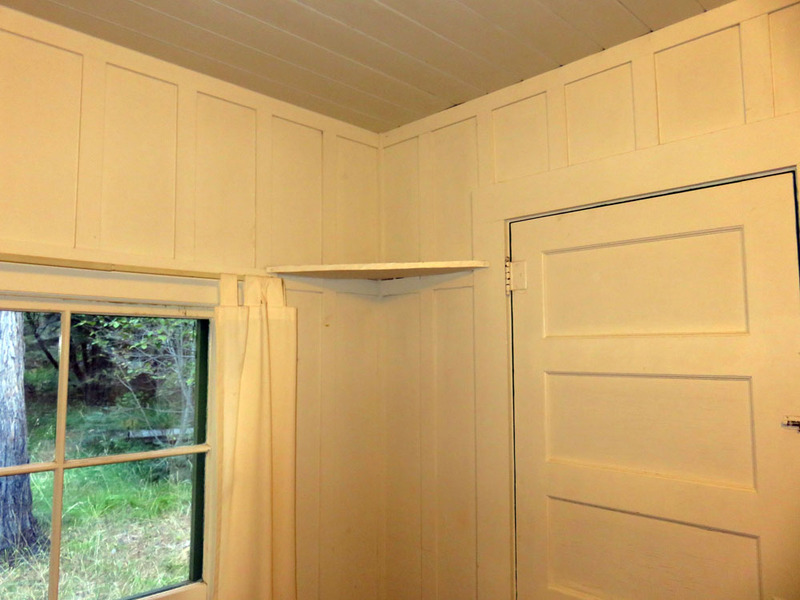 So we found a tiny two-room cabin at the nearby historic Mill Creek Resort. Take away the plastic chairs and this little cabin in the woods evokes vacations of the past. 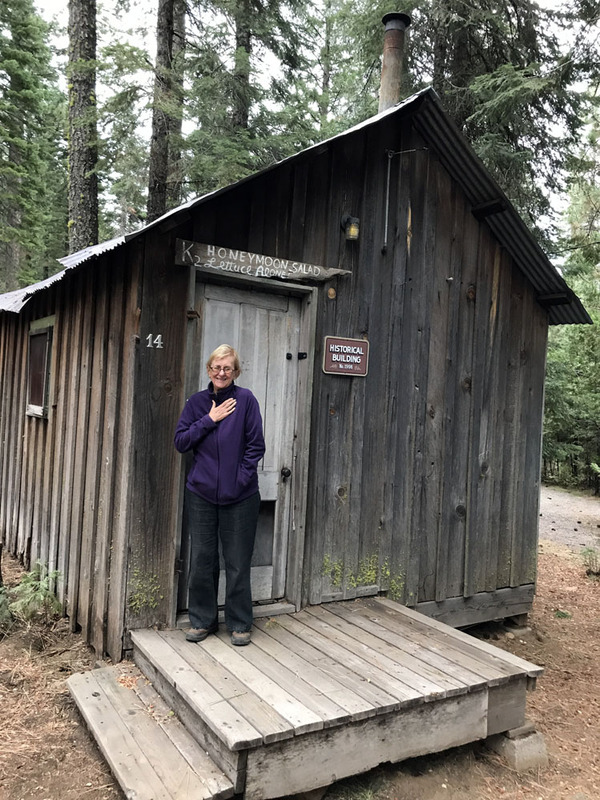 Here were the sort of countrified accommodations early motorists stayed at while on vacation: rustic individual wooden buildings set in a forest, with simple kitchen, tiny bath and a bedroom. We were thrilled with the setting. 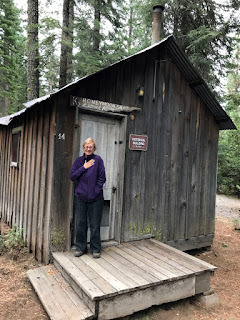 Our host apologized that the nights were a little cold to keep the back door of the cabin open — so we could hear the little creek bubbling behind the building. One "historical" cabin preserved its original appearance. 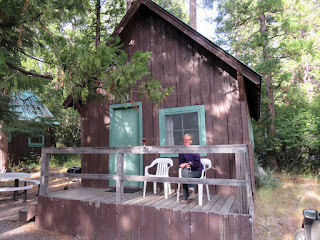 Outside, the cabins were cute and evocative of an era long past. An interior designer's nightmare met us inside. A hulking modern refrigerator loomed next to a small (and rusting) stove. The full-size new hot water heater dominated the decor. A once tidy wooden kitchen counter had been "improved" to include an out-size stainless steel sink. Never mind. I still found plenty to remind me of the old days. Signed "R.G." 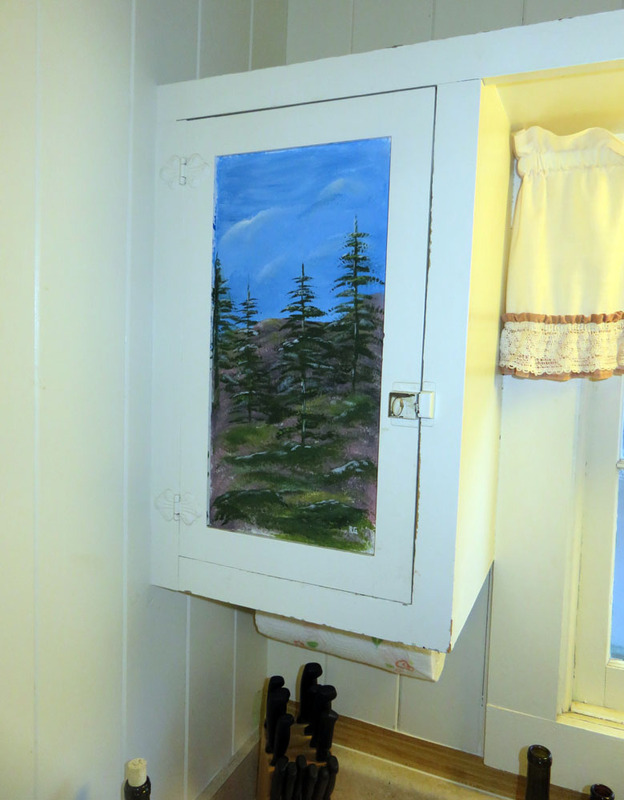 some long-ago visitor left an original painting on a kitchen cabinet. Wooden prop rods were used to keep the windows open, when desired. 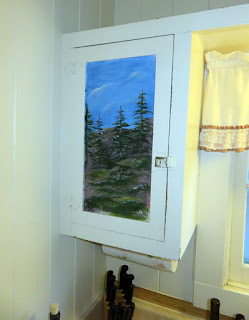 Some long ago visitor had painted a view of the forest on one of the kitchen cabinets! Another bit of artwork decorated what I took to be an ancient light fixture. It was even better than that. 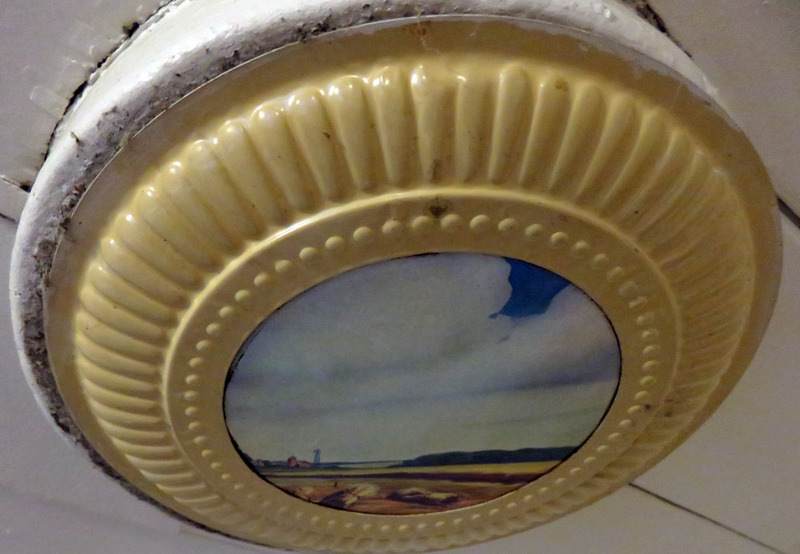 Reader Chris Overton pointed out that the round thing on the ceiling was evidence that a wood burning stove had once been present. Based on its size and position near the wall it undoubtedly was a cover for the hole in the ceiling once used for the chimney pipe. The artwork on this one was probably printed rather than hand painted — I found something similar, described as a vintage item, for sale on Etsy. I thought this round object on the ceiling was an out-of-service light fixture. It turns out to be evidence that a wood burning stove had once been present. The cabins have new looking metal roofs, but one, labeled "Historical Building" has been preserved as they all probably looked back in the day. I wasn't able to find out how old the buildings really are, but the web site claims the Mill Creek Resort is "almost as old as the hills." 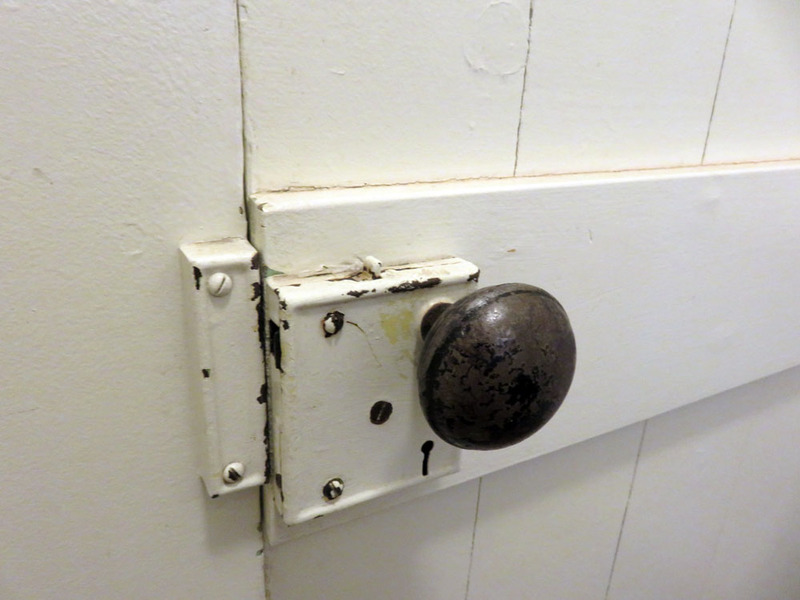 Antique hardware on door really dates the place. Retro looking is fine. Ultimately, though, you can't beat the real thing. See it? Tiny shelf in bedroom corner touchingly offers to store your stuff. Of course it's actually completely useless.